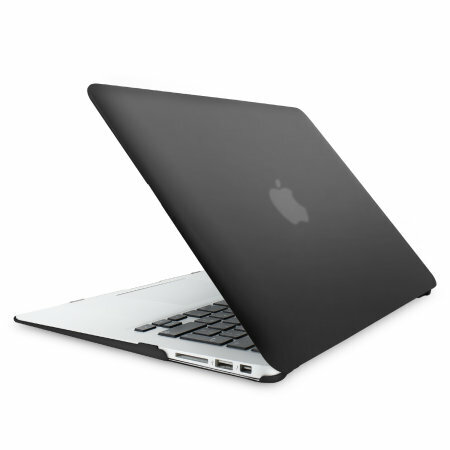 The ToughGuard Hard Case in black gives your MacBook Air 13 inch the protection it needs without adding any unnecessary bulk. Compatible with 2009 to 2017 models with codes A1466, A1466, A1369 & A1304. Spot on n great price. Absolutely perfect. Fits and is smart. THE SHELL FITS THE COMPUTER REALLY WELL...ARRIVED IN TIME, WELL PAKAGED ETC. I was a bit worried as this item was out of stock when I first tried to order it but as soon as it came back into stock I was informed and it was delivered promptly and at a good price. good material, worth its price. none. every online purchase is a risk but otherwise will purchase again. It looks really good! The logo shines through and looks sleek. Only issue is finger marks show up quite easily but can be easily fixed with a wet wipe to clean the cover. I think I might not use the cover under the keyboards as i think I'll heat up the Mac easily, more so than without it??? Not sure. Pretty light too! OVERALL it's great! Great cover, fits perfect and good value. Do not forget its soft touch so does leave grease marks, but great protection. Very happy with my laptop cover. Fits great, looks great and it was a great price. Seems to be slightly too small on the base or something, my 13 inch mac book air doesn't quite sit in in perfectly so its a little uneven on the base but it'll do for now. The Olixar Toughgaurd MacBook Air 13" case is great. I would recommend this for others to buy. It has a nice design and fits perfectly on the MacBook Air 13" laptop. You have to use some pressure to snap it on. It is lightweight and covers both the top and bottom of the MacBook. It does cover the apple symbol and does not come with its own apple symbol, which I was dissapointed about. Otherwise it is great. ordered, paid for, and received my Macbook Air, hard cover, in no time at all. It arrived well packaged and undamaged. It fits perfectly and as well as protecting from any knocks or bumps, actually improves the look of my laptop. I can still see the logo lit up through the cover. All together a great buy in my opinion. This case is great value for money and not only protects a 13" MacBook Air but improves its looks as well imo. The fit is truly superb, the matt finish is easy to clean with a damp cloth and the translucent material lets the illuminated apple show through. There are rubber feet to stop slipping, and heat vents on the underside too. Cut aways on the sides allow access to all ports. Great item. Bought this due to the low price and because it looks aesthetically pleasing. I didn't expect much regarding protection as the price was low, however apart from it obviously stopping any scratches, my laptop has maintained it good condition with no dents although I am prone to dropping it quite a lot. I would give this product nine and a half out of ten. The case was everything I was looking for; just a just thin black skin case. I had previously bought a cheaper one on eBay but the fit was terrible. This clicked in nicely. Only criticism is how long it took to arrive - almost a month after I placed the order. Very pleased with this item - exactly as described. Well designed and perfect fit for the 13 inch Mac Air. Provides protection without adding any noticeable weight or adversely affecting the slim profile of the machine. One nice little touch that I think shows good attention to detail: On opening the lid the apple logo remains visible through the cover. I ordered the product and the delivery was so fast it was unbelievable. I brought a case for my mac it is great quality, lovely colour and has protected my mac about 1000 times, without this case I think my mac would be broken by now, definitely recommend to anyone. Delighted customer...a really affordable price for something I've needed for ages. It's a stunning colour of blue, fits perfectly and does the essential job of protecting my precious Mac. Apart from the fabulous colour I also love the smooth, matt finish. Certainly no wondering where I've left my laptop any more, it's on permanent display! The case took a little while to arrive but more than made up for it! It popped on I like a second skin and is a perfect fit. I can't comment on the durability yet and am not about to rough it up for review purposes but It looks and feels great to use. Very surprised. This case looks great and fits the MacBook well. It's sturdy and was easy to fit. For the money I can't fault it. Well worth getting. Thanks mobile fun. Cosmic Haze case - recommended! Really pretty case. Clips on easily. Good quality and fit. Well-graduated tint - slightly see-through so Apple logo visible. Feels slightly rubbery which makes the laptop less slippery. I love it, my mother loves it, my daughter loves it. Recommended. GREAT PRODUCT. MY DAUGHTER IS VERY HAPPY! I bought this product for my daughter so she could take her new IMac to school. She loves it. It is very protective and fits on the laptop beautifully. Very impressed with the colour and fit of the case. Cover fitted well. Looks great! My daughter loves it. The cover we bought was very good and will protect the laptop. It also looks modern and functional. It took a couple of weeks to arrive. Easy to fit on, looks good and protects the Mac really well! I had expensive McBook Air case which I was using for 2 years and it broke. I did not want to spend so much money on previous which only last for less than 2 years. So I ordered this product from MobileZap. I was surprised by the premium quality of this case. I would recommend don't waste your money on other expensive cases and buy this case. Having bought my Macbook I wanted to make sure it was protected at all times. The ToughGuard case fits easily and looks good. The only downside is that the colouring on the padded feet has already started to rub off but at this price point I am still more than happy. I may be tempted to spend a bit more on a more upmarket cover if I can find one and would be very happy to use Mobilefun again. Great product. Love the look & protection for my Mac. I have a thirteen year old who wants a gold coloured MacBook Air for her birthday. I have a MacBook Air that I am no longer using. Your cover has solved two problems for relatively small money! Thanks. Bought this for my Daughtet, really good value, strong case, which aldo looks very good. This is a very good product to protect your Mac Air. I have already dropped my Mac air with the tough guard and it is still perfectly fine! Ordered macbook air headcase,it's good quality and it fits perfectly. Easy to install and feels protective. I have dropped my laptop a couple of times since then and nothing happened to it. It covers the edges so it prevents scratches and dings. It has openings on the bottom to let the laptop breathe, as well as small stands that would allow you to place the laptop quietly on a surface, without worrying about it scratching. In terms of design, I got a purple one, and it's light purple and transparent--exactly how I wanted it. If you have stickers on the actual laptop, they will show. The Apple logo lights through the case--which I also like. Overall, it's light, but protective, colorful, but transparent. Buy it and be sure that your laptop is in good hands! This is the first item I have bought from this website. The laptop case is just incredible, You can clearly tell it's in a pristine quality! very happy, will shop on here again for sure! Very happy with the cover. My daughter was thrilled to receive it on Xmas day. Very happy with the cover. ...my daughter was thrilled to receive it on Xmas day. Service provided was excellent.....I was constantly informed on time frame for arrival. Would definitely order from here again. Very nice, light weight, beautiful colours! The team kept me updated on the product's status. I mistakenly ordered a cover for a MacBook Pro rather than the MacBook Air version I had intended so I was forced to use your returns service which was simple,very user friendly and efficient. I received the correct product by return post and am pleased with my purchase. Thank you Mobile Fun - great customer service. The product is good and the delivery was fast. It looks nice and is very smooth. Love my new cover its really cool and was a good price, I did make te mistake of picking the "Snail mail" option for shipping so took longer as didn't realise it was coming from the UK, nextime will pay the extra postage. Good customer service was provided on following my item up as well.